Leveraging hybrid clouds has substantial benefits and everyone wants to take full advantage of them. Since Barracuda's NG Firewall, Email Security Gateway, Email Security Gateway, and Message Archiver can easily run on VMware, these products can easily make the move with you. This provides an easy transition for your critical workloads. Email servers that reside in the cloud and on-premises deserve the same level of comprehensive security, simplified user access, email management, along with redundancy and disaster recovery to ensure eDiscovery/compliance. That's why it's smart to put Barracuda's proven solutions on the job - Barracuda Email Security Gateway and Barracuda Message Archiver - sharing the same technology and the same suite of features available in our hardware appliances. As technology moves to hybrid and cloud services, the Barracuda Email Security Gateway for VMware vCloud Air allows IT professionals to extend and protect on-premises email content security infrastructure in the event of a disaster to a public cloud-based service. 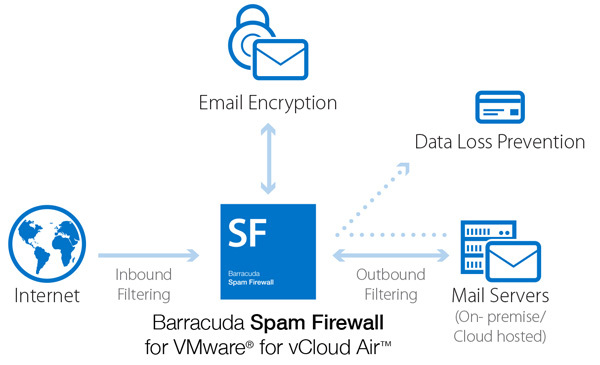 Managing all inbound and outbound email traffic, the Barracuda Email Security Gateway for vCloud Air protects organizations from email-borne threats and data leaks. It provides security against zero-hour spam and virus attacks with real-time protection from Barracuda Central, Barracuda's real-time threat intelligence platform to ensure organizations remain productive in the face of evolving threats. 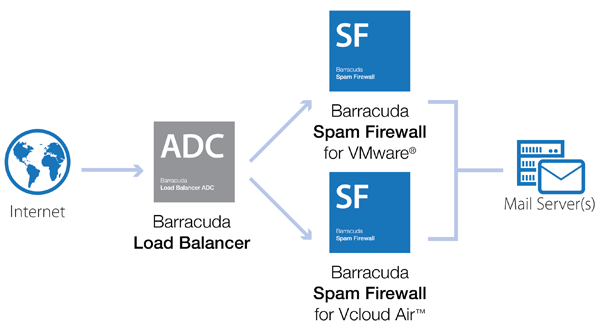 Along with best-of-breed email threat protection, the Barracuda Email Security Gateway for VMware vCloud Air offers Data Loss Prevention (DLP) to block confidential or sensitive information, such as credit card and social security numbers, from being leaked outside an organization and email encryption to secure email communications at no additional charge. The Barracuda Email Security Gateway for VMware includes spam and virus blocking, data protection, email continuity, DoS prevention, encryption, and policy management-combined to deliver a complete solution. As new requirements emerge, it is automatically updated with new capabilities to ensure continuous protection. 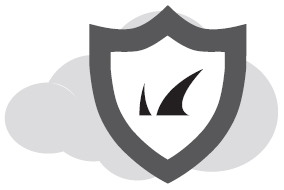 The experts at Barracuda Central work 24/7 to monitor and block the latest Internet threats. Data from more than 150,000 collection points is analyzed to create and deliver protection against previously unknown threats within minutes of their discovery. vCloud Air™ is a public cloud platform built on the trusted foundation of vSphere, compatible with your on-premises data center, that includes infrastructure, disaster recovery, and various applications as service offerings. You can migrate your existing onsite Barracuda Email Security Gateway Vx virtual machine(s) to the public cloud or start up a new Barracuda Email Security Gateway Vx directly in the cloud. Many organizations are migrating to the cloud to take advantage of the economic gains and operational efficiencies inherent to non-hardware based solutions. They're also looking to the cloud to extend their current on-premises environment to a hybrid environment, helping to ensure business continuity in a disaster recovery situation. Barracuda's Real-time Intelligence Framework Provides Layered Protection against Email-borne Threats. The Barracuda Email Security Gateway Vx for VMWare offers a comprehensive email content security solution that extends and protects on-premises email content security infrastructure. The Barracuda Email Security Gateway for VMware is a proven email security solution that protects both your inbound and outbound email traffic with advanced email security and threat detection features. These features utilize Barracuda's real-time threat intelligence framework to guard against zero-hour malware, Denial-of-Service attacks and other threats. Bulk Email Management: Our Email Categories feature gives control over the types of solicited and unsolicited email allowed into users' inboxes. Additionally, should your email server be unreachable for any reason, email continuity is offered by the Cloud Protection Layer (CPL) of the Barracuda Email Security Gateway Vx. Emails can be spooled in CPL and re-delivered once the mail service is available. The separate CPL interface also allows for viewing and downloading of all incoming emails. With organizations migrating to hybrid environments, integrating the Barracuda Email Security Gateway Vx for VMware with our email security appliance, either virtual or hardware, leverages the benefits of both on-premise and cloud to provide optimal email protection. In the event of a disaster, the Barracuda Email Security Gateway for VMware vCloud Air offers customers an easy-to-use cloud-based solution to secure your email server by managing and blocking incoming and outbound email-borne threats. Any organizations using a Barracuda Email Security Gateway Vx in a VMware environment are able to take their existing virtual licenses and migrate it to VMware vCloud Air if their on-premises solution goes down. This easy-to-use solution provides flexibility in deployment as well since installation time is minimal, and can be done before, during, or after your transition from an on-premises email security solution. 2 Licenses for additional cores can be purchased to add capacity for more users. 3 Each added core increases capacity by 1,000 - 1,500 users depending on features selected.